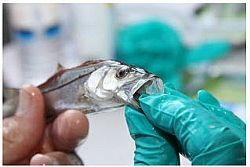 On Aug. 15, 2014, scientists with Mote Marine Laboratory and Florida’s Fish and Wildlife Conservation Commission released hatchery-reared juvenile snook into the wild as part of an ongoing program designed to find the most effective methods to replenish and enhance wild snook populations. The species is one of Florida’s most popular sport fish and plays an important role in drawing recreational anglers to the state. According to the American Sportfishing Association, Florida is the top-ranked state in economic output from recreational fishing, which draws $8.6 billion to the economy annually. Saltwater fishing alone generates 80 percent — $6.8 billion — of that income. Snook, along with red drum, are the main test species for restocking efforts statewide. This project — which involves tagging and then releasing more than 2,200 snook into Sarasota Bay during over three days — is designed to determine whether snook that have been conditioned for release at Mote have better growth and survival rates in the wild.